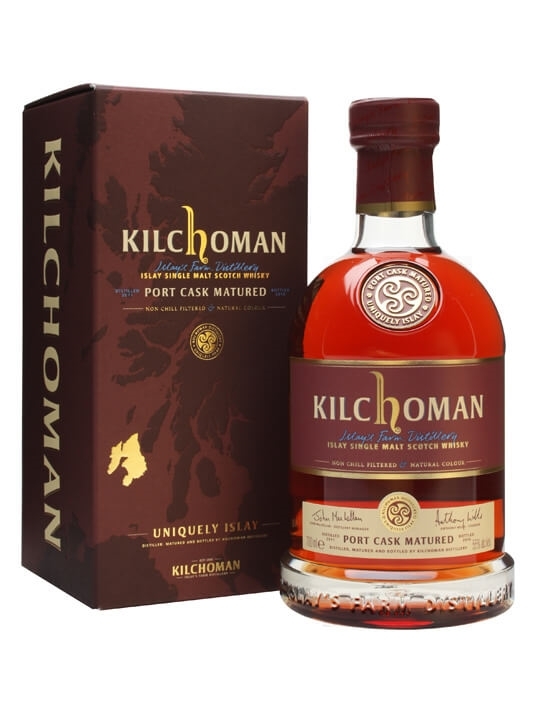 Here’s the fifth dram from the Manchester Whisky Club’s tasting with Kilchoman, the Port Cask. This was released last year and sold out very quickly indeed. The original release was watered to 55%, but we’re very luck to be trying an original cask sample at 59%! Nose: Smoked cheese with brandied cherries. Musty dunnage warehouse. Barley grain. Palate: Fizzy sour strawberry laces, with tart raspberry, soft grape, and a Lapsang Souchoung smoke running through. Finish: Drying with chewy peat and savoury oak. The distillery started with 20 fresh 1st-fill port casks back in 2011 and filled them with spirit straight away to capture the flavour. At 3 years old they decided to release it because the port was having such a strong influence on the whisky. Any longer and it’d have looked like Ribena! The colour on this is amazing – you almost never see a whisky of this hue. After time in sherry it darkens but almost never to this pinky/reddish colour. It’s an interesting dram, for sure, but it’s quite a departure from what you’d expect from a whisky. The port influence has given it a lot of soft-fruit notes which are pleasant and refreshing but they’re kind of fighting against the peatiness of the whisky. A really interesting one to try, nonetheless. Originally posted on Manchester Whisky Club.